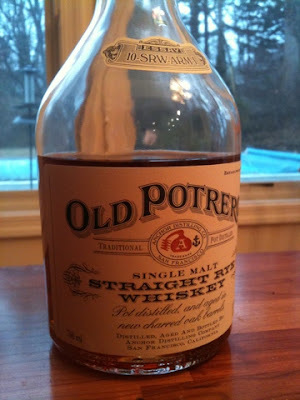 The Coopered Tot: Old Potrero Single Malt Rye: a powerful jolt of rye - sweet, peppery, and herbal all the way home. Old Potrero Single Malt Rye: a powerful jolt of rye - sweet, peppery, and herbal all the way home. The brewers of Anchor Steam Ale helped launch the microbrewery revolution in the 1960s with their attempt to recreate a 19th century style of ale. The decade old effort at a distillery started with attempts at 18th and 19th century style whiskeys. 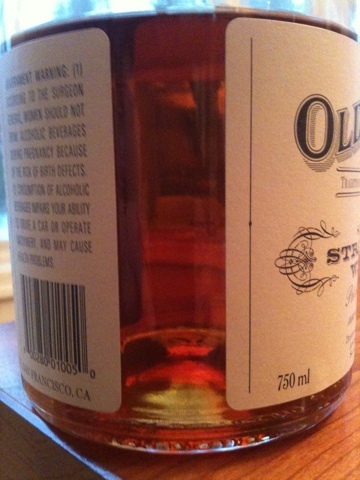 The current offering is a 100 malted rye. Recently Whistlepig and Willets have gone down this road - but Anchor Distillery has been doing 100% malted rye for a while. There have been some good reviews. Most folks agree that the various Old Potrero offerings are all very unusual; different from all other whiskeys. Nose: warm sweet malt with a prickly herbal note that smells a lot like hops. The initial impression is warm buttered honeyed beer. Maybe Anchor Steam Ale in particular, or is that just my imagination? There's a richness to the nose that is seductive. It smells like buttered hot corn in toffee caramel with some nice hopsy ale. Entry is smooth and dazzlingly sweet. There is an immediate peppery explosion that dazzles the tongue like a densely carbonated beverage. Then a ton of herbal flavors: cilantro, caraway, and hops absolutely dominate the palate. The transition to the finish is marked by deep toffee sweetness and a dank quality like humid paper, parchment... old skins. Fade out is long and slow with a bitter herbal note (I swear it is hops) hanging on for minutes... just like Anchor Porter. Did they seek to make a whiskey that tastes like high end beer? Am I just making it up - suggested by the "Anchor"name in the middle of the label? Repeated drinking sessions show that this herbal hops note is really, honestly there. So is this good? It's certainly different. Rye is usually a minority player because of it's spicy herbal nature. That nature is on full display here. Rich and sweet with a powerful and aggressive spicy aspect and tons of pungent bitter herbs. I say it again: cilantro, caraway, and hops. It's strong meat.